The Pathway to the Future: NC State’s 2011–2020 Strategic Plan presents a strong mission statement and bold vision, while taking into account the current financial climate. In order to align with the strategic plan, the physical campus must also evolve to support strategic directions and operational realities. WHAT IS A CAMPUS CAPACITY AND ASSESSMENT STUDY? A Campus Capacity and Assessment Study provides a communication tool for leadership and serves as a mechanism to guide prioritization and decision-making as it relates to the physical campus. It provides the framework for engaging the campus community in a rich dialogue about what is best for NC State. It is not a master plan and does not provide detailed solutions for development. Rather, the Campus Capacity and Assessment Study complements the 2014 Physical Master Plan as a high-level overlay and guiding document. The Campus Capacity and Assessment Study provides a tool that supports the alignment of the physical campus with the mission and vision of the institution. It does not set the strategic direction of the University nor does it provide a funding mechanism for projects. If a project has a physical component, however, the Campus Capacity and Assessment Study provides a set of principles that serve as a tool to evaluate decisions related to highest and best use for land and overall campus development. 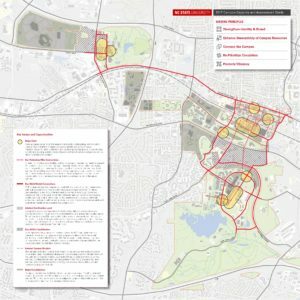 NC State University engaged Ayers Saint Gross and HR&A Advisors to develop a Campus Capacity and Assessment Study and provide a comprehensive assessment of the Raleigh campus – the North, Central, Centennial, South, and West precincts. During the six-month process, the planning team met with academic leadership, administrative staff, community neighbors, external agencies, and students to define key issues and opportunities on and around campus and establish guiding principles that address the key issues and opportunities. The 2017 Campus Capacity and Assessment Study Guiding Principles include the following: Strengthen Identity and Brand, Enhance Stewardship of Campus Resources, Connect the Campus, Re-Prioritize Circulation, and Promote Vibrancy. Strengthen the identity and brand of NC State by leveraging its location in the region, creating welcoming gateways for the surrounding communities, augmenting existing iconic spaces and buildings, and clarifying campus edges and gateways. Enhance campus stewardship by ensuring the highest and best use of land and resources, excellent teaching and research facilities, and quality of and connectivity between the University’s diverse landscapes. Advance the culture of collaboration and interdisciplinarity by improving programmatic adjacencies and mobility, and creating strong connections between University landholdings. 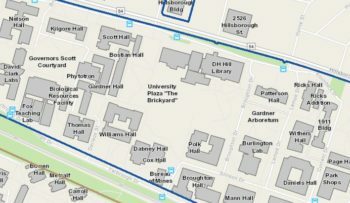 Create a closer campus community between geographically-dispersed units by re-prioritizing modes of circulation on and around campus to provide a safe, healthy, and active campus supported by consistent and reliable transit. Promote a vibrant campus by creating spaces for collaboration and gathering, concentrating activity and density, and ensuring a mix of uses in each precinct.